I’ve known Rachel to be a restless traveler who, like me, worships the beach while embraces the pricking rays of the sun as if this combo is the best thing God has ever created. We’ve been planning our beach trip together for a very long time and for some reasons we’d only made it happen many months back (throwback post, hihi!). 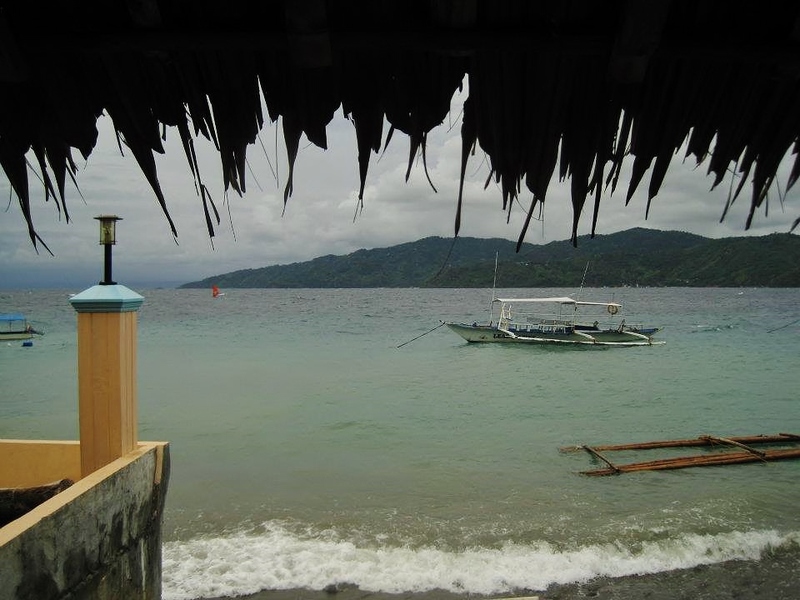 We were actually targeting to hang out at Sombrero Island but due to some unfortunate events we ended up windsurfing in Anilao. No regrets though, it was a fun though gloomy day. We didn’t wanna go home without drowning a little and accidentally gulping sea water so we stayed where we were and just hoped to enjoy what the day will bring. 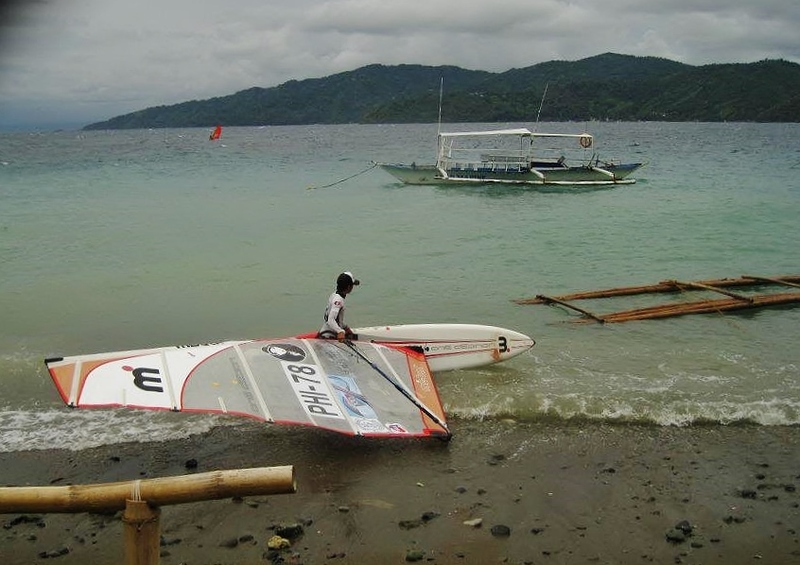 We decided to try windsurfing when we met German Paz while scouting for a good resort. He offered us a friendly first-time-windsurfer price that was truly affordable and made us forget all the hassle brought by the storm. German Paz, just so you know, is the coach of the Philippine Windsurfing team who already joined many international competitions. We were introduced to a few teenagers with unbelievable sinigang-cut abs (sinigang is an all-time Filipino favorite sour tasty dish that Rachel and I use to describe beautifully shaped abs, hehe! Don’t ask how we came about using sinigang, haha!) who happened to be kuya German’s trainees. With all the friendliness aura in kuya German plus the existence of Archimedes principle of buoyancy, we trusted him that he can guide and teach us to windsurf despite the furious waves and winds. Each blow of the storm wind under the gloomy dark clouds were too strong and heavy that we found it difficult to balance on the board and control the sail. So we let kuya German do all the works while we just held on to a part of the sail. He let me and Rachel sit on the board together on our first ride while he windsurfed so we could get a feel of the ferocious waves and cold wind in the middle of the sea. learning how to balance on the board. . hehe. .
smile! Let the games begin! 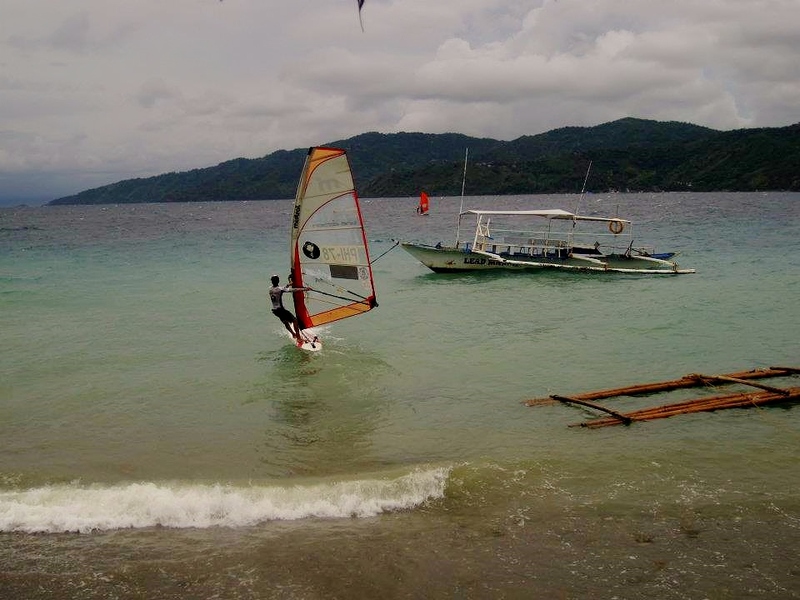 We, specially me, had a lot of plunging and drowning experience when coach tried to let me windsurf alone. But I still trusted kuya German he’ll not let me die. Haha! I salute his stamina for controlling the sail on the worst weather condition while teaching both Rachel and I in a 1-on-1 alternating mode for the whole afternoon. When it’s my turn to rest (and it’s Rachel’s turn to windsurf), I didn’t feel bored and alone in a small nipa hut back at the resort where I met a lovely windsurfing-enthusiast couple (kuya German’s friends) and a few of coach’s trainees sharing with me all their windsurfing experiences over some shots of alcohol, unripe mangoes and few sticks of cigarettes. 🙂 We stopped windsurfing as soon as the dusk sky was realized. Kuya and his team were indeed very accommodating to the 2 lost ladies in Anilao, they even invited us to join them feast on their homecooked dinner. Our humble hearts were really blown away by their genuine hospitality. The dark gray thick clouds are proof that the weather isn’t safe for windsurfers but coach braved the raging seas. my lovely friend Rachel who doesn’t seem to get tired after all the windsurfing experience. still pretty with a nice smile. Me? I looked like a drowned panda on the other side of the camera. . hehe. .
the best (in this case, it’s the worst) photos of yourself are those stolen shots. hehe. .
Hi Denice! 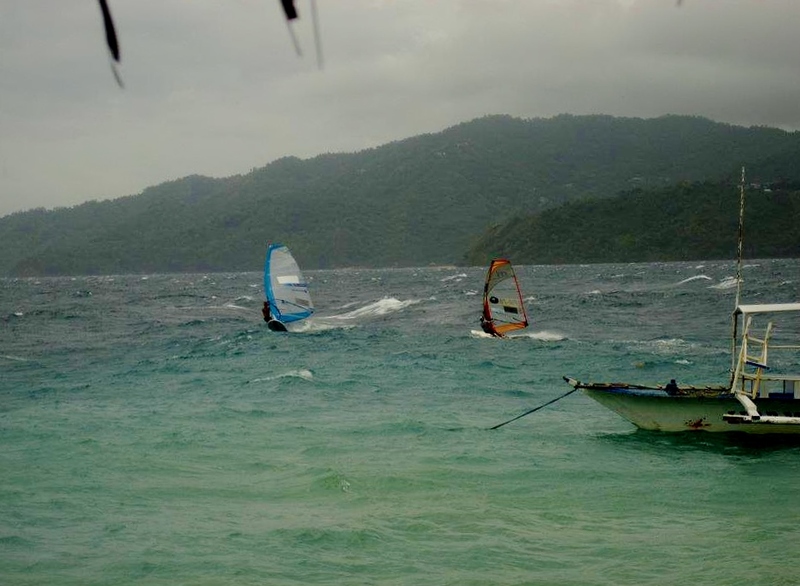 Who can I contact for a windsurfing lesson in Anilao?